We’ve been in Ecuador since this past Friday morning, August 4th. We crossed the border on the one year anniversary of the launch of this trip. Border crossing days are hard and I kind of go on autopilot; the drill has generally been the same throughout this whole trip. We turn in Moby’s paperwork and get ourselves stamped out of one country then get ourselves stamped into the next country and repeat the process of securing legality for Moby. If you’ve ever wondered what it’s like to drive across borders in Central and South America it goes something like this. First, you wait. Either there’s a slew of commercial truck drivers also waiting for clearance or it’s breakfast time or coffee break time or some other very good reason why there’s no one at the desk. When someone does appear there are copies to be handed over of everything: title, registration, drivers’ licenses, and passports. Then all the information is entered into a computer and hopefully we receive an official document with all the correct numbers, correctly spelled names, and accurate dates. This can be tedious. However, the process of entering Ecuador was surprisingly easy. Instead of copies the agent simply took photos of all of our documents and Moby’s license plate. Within a few minutes the photos were merged with our entry file and our TIP (temporary import permit) spit out of the printer, all t’s crossed and i’s dotted. It was a miracle. Fortunately enough, border towns are rarely anything special and it’s not as if the simple fact of moving a few hundred feet changes anything. As we rolled away I had no “So this is Ecuador!” epiphany. I just noticed that we’re still in the Andes, everything still looks like my beloved Colombia, and I have a lot to say about that. So here are some more of my notes from our time spent in this fascinating, frustrating, and oh so intriguing country. We use Google Maps to navigate our way through this journey. For the most part Tammy (our name for the tiny lady who lives in Will’s phone) does her job well but there have been times when she’s put us on dead end dirt roads, had no idea that streets were closed for a festival, and other things that has us cursing poor Tammy. But sometimes she makes us laugh. One day we were going to McDonald’s for lunch outside of Bogota. Tammy got us there but as we were preparing to turn into the parking lot she said, “Turn right on Em Cee Donald’s.” That’s right, the m and the c were enunciated followed by donald’s. We got a good laugh at that one. Oh, and when we use maps.me (another navigation app) the tiny lady who spews out directions is Kiera because she has an Australian accent and on the odd occasion that the Spanish lady talks to us she is called Lorena. Sometimes you have to make your own fun; the simple act of travel doesn’t always just hand it to you. When we were driving to Valle de Leyva we found a wide spot in the road to pull over and get out for a minute. It was a long drive that day and we had already made uneventful stops. However this one was different. There was a small building near the place where we pulled over but no real sign of people. So we’re standing on the passenger side talking and I spied a young Colombian guy coming down the hill toward us, machete in hand. We were both prepared to bolt back into the truck but when he reached the ramshackle barbed wire fence he put his machete down before climbing through the wire. He approached, hesitant greetings were exchanged, then he asked if we wanted hierba, or weed. We kind of laughed and politely declined and he went back through the fence, picked up his machete, and disappeared up the hill. Will looked at me and said, “That was courteous of him to put down his machete.” Yes, yes it was. Our stops aren’t always at friendly campgrounds populated by fellow travelers and renditions of “Kumbaya” by a roaring bonfire, although that does happen occasionally. More often, especially when we’re driving with a far off destination in our sights, we stop wherever is convenient and looks safe, although that’s relative. And we’ve found that, in Colombia, these places are generally restaurants. They typically have large, flat parking lots, clean bathrooms, and wifi. If we order food or beers we can usually stay as long as we want for no charge. But the free factor isn’t why these restaurants make excellent stopping points. It’s the owners and staff members that make these restaurants some of my favorite places we’ve ever stayed in Colombia. One night in San Gil we had actually planned to stay at a hotel but their kitchen was closed. We headed down the road to another restaurant and when we chatted with the owners over our meal they invited us to stay, so we did. When I drank all their wine el patrón hopped on his motor bike and went to get more. Another time we had to leave a campground because they had no water, not even for the toilets. We drove to a restaurant and set up shop. The owner was a lovely lady and we chatted a lot. I mentioned that Colombian style lentejas (lentils) are my favorite dish. They didn’t have any but, again, someone races off on a motorbike and returns with what I wanted. Since lentils take a long time to prepare they weren’t ready until the next day but the lunch I had before we left was divine, including the lentils. I’ve always been a voracious reader but, as you can imagine, I read a lot on this trip. Much of my reading material consists of previously read and loved novels by Stephen King and YA books about horses. Will, on the other hand, reads a great deal of nonfiction and will occasionally recommend a title to me, knowing I probably won’t read it. However, after he talked up a book called The Outliers I decided to give it a go. Wow. It’s really, really good. The basic premise is about the many different factors at play when we look at what success is and is not. My favorite part was about how a flight crew’s culture can cause planes to crash and some of the reasons Asian people tend to comprehend mathematics better than westerners (since I can count in Mandarin I already knew part of the reason why). It’s a really great read and I hope you’ll enjoy it as much as I did. After a year on the road we’ve finally incorporated podcasts into our lives. I honestly don’t know how we survived on music alone this whole time. Podcasts make me feel smarter and we then have stuff to talk about over dinner because, frankly, there are times when we don’t have a whole lot to say to one another. Talking about politics has gotten so dreary. My favorites thus far are Lore and Stuff You Should Know. Lore is basically every spooky myth, legend, or true story you’ve ever heard cleverly written and narrated by the smooth talking Aaron Mahnke. Stuff You Should Know is exactly that. I never fail to learn something new each time we listen to an episode. The ones about the Galapagos and the controversial use of solitary confinement in prison are two that I found really interesting. Plus, the hosts of SYSK have a great connection and banter that make each episode more fun. The episode about porta-potties is a great example of this. If any of you have any recommendations for other podcasts please drop a comment below and help fuel my new addiction. Describing Colombia from a natural beauty viewpoint is damn near impossible. It reminds of the film “Contact” and the part where Jody Foster’s character finally goes through the wormhole. As she stutters and stammers into the microphone attached to her helmet she finally says, “They should have sent a poet.” That’s how I felt nearly every day in Colombia. It’s so beautiful, so majestic, so abundant, and so dumbfounding that I felt, well, DUMB! There’s no way to describe what it looks like when you’re high in the Andes. So high that you’re shivering in hastily thrown together warmies wondering how the hell there can be bananas ripening on trees and hummingbirds lazily making their choice from hundreds of flower varieties. I know a few poets and I hope they see this portion of the post. Ladies, get your asses to Colombia and do it some justice. Calla Lilies in the wild? Yes, at 9,200 feet in Colombia. One of Colombia’s most visited areas is Cocora Valley, located about 100 kilometers east of Bogota. Parts of the area are as high as 9000 feet and located there in the cloud forest is a grove of some of the most unique trees on the planet. 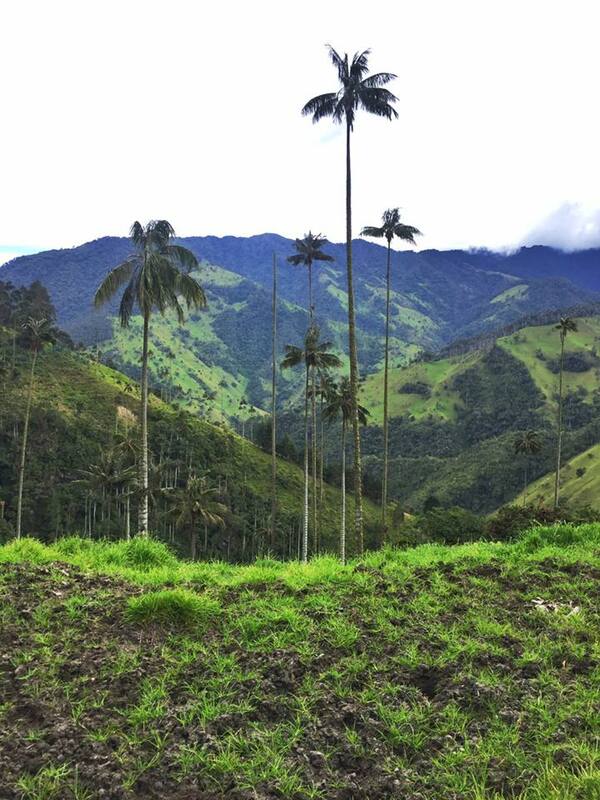 The wax palms of Cocora are Colombia’s national tree and can reach heights of 200 feet. Of course we had to see this miracle of nature. But do we go to the park like everyone else? Of course not! That’s too easy. The giant Wax Palms of Cocora Valley. Will found a spot on the map out in the middle of nowhere and as we made the turn onto the dirt road to get there my stomach dropped. It dropped even further as we lurched along this rutted, washed out track that has collapsed in places, leaving our wheels precariously close to the edge. It turned out that this road only gave us a brief glimpse of the palms before we parked in a grassy, wide spot in the road. 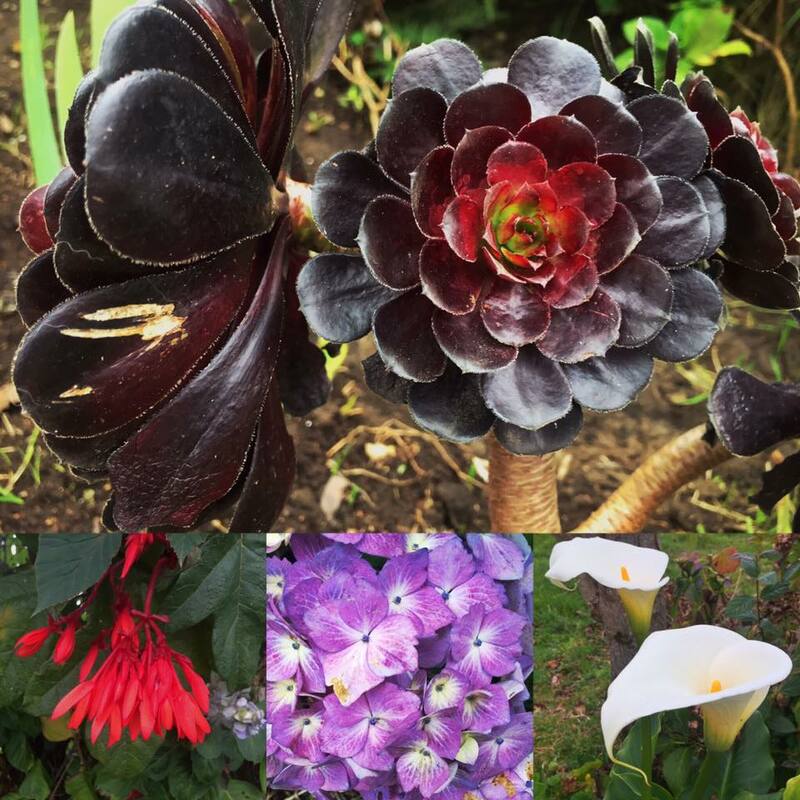 I fussed and fretted about the possibility of being too close to someone’s coca plantation (a not unusual fear) and what sort of wild animals we’d encounter (a vicious rabbit/pika hybrid). But there’s something to be said for being that far away and that remote in a country like Colombia. It’s humbling in its vast wildness. You all know that Colombia lured me in with a siren song so sweet I don’t think I can ever unhear it, although I didn’t hear it at first. The robbery in Barranquilla left me so shaken I didn’t think I’d ever feel anything but disgust and fear in this wild and unpredictable land. But that’s a big part of the charm. From the street art of Bogota to the untamed Andes and, best of all, the intelligence, tenacity, and kindness of the people Colombia surprised me every day. 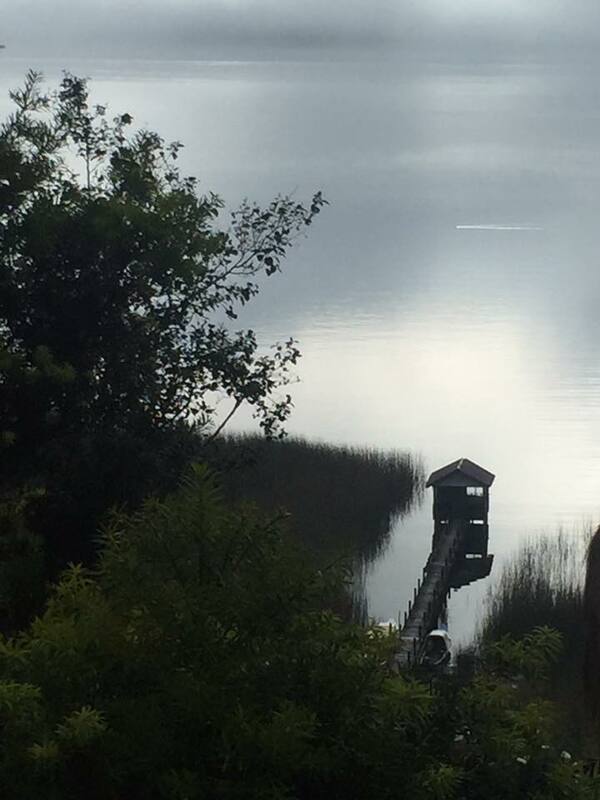 Misty morning on Laguna La Cocha. I’ll be back. I’m sure of it. Radiolab Podcast…if you start at the beginning you should be good for a week or two.